Spare Wheel Covers by 4wdwheelcovers.com.au - Custom Spare Tyre Covers to suit your 4x4 vehicle. Spare Wheel Covers - Custom Made for Your 4x4. Our 4x4 spare wheel covers are custom made to suit your requirements and tyre size exactly. 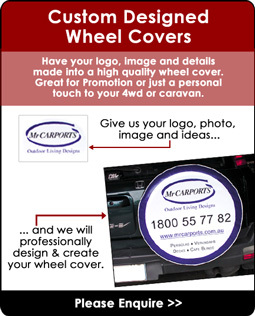 Why advertise someone else's business when you can personalise your 4wd wheelcover or advertise your own business? 4wdwheelcovers.com.au can expertly design and make a personalised spare wheel cover, whether it is to advertise your business or just to have some fun and raise a smile from those following behind you! Our speciality is designing a great looking 4wd accessory that will enhance your vehicle. You can choose one of our many stock designs, but you may like to have your own unique design, logo, photo or other image created. Maybe a favourite photo or holiday setting? Pets, people, logos, products and anything else you can imagine. We will layout and design a cover for you and send a proof before manufacture. We then dispatch, direct to your door. As most of our covers are fully custom made, they are sized exactly to suit your vehicle, ensuring a great looking cover which fits perfectly. Our new web site is a lot more streamlined and easier to use. Easily enquire for your custom designed spare tyre cover and upload artwork and ideas easily. Made for easier viewing on all devices. We have many new stock design tyre covers on our new site and are always adding more. We had a bit of confusion with 4wdwheelcovers.com.au as a lot of people who are chasing caravan spare tyre covers often asked if we made covers for their caravans, which we do, among any other spare tyre cover. This led us to a name change, sparewheelcovers.com.au which makes a lot more sense!